And I had the entire dump of Hasjobs postings. It was pretty cool of Kiran to send them across to me and saving me the time and effort to scrape that data. At that time I had very little idea what I would do with it. I am aware of R and this was the moment when I thought I could make use of the little knowledge of it I had. Step 1: Step R on my system. Surprised ? No ? 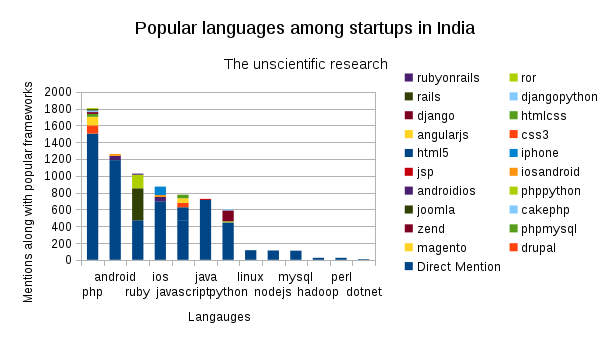 At least I am because the one technology no one talks about but seems is highly used by Indian startups is PHP. Rest sound very reasonable to me. What do you guys think ? Following was the code I wrote to extract the results. Let me know if I am missing something.